I only realised that a major version was out after I downloaded and uncompressed wordpress.tar.gz… Maybe I would have hesitated like you if I knew this. I think its a good idea that you upgraded to WordPress 2.5, because now the images of your blog are displayed in my Google Reader which was not the case before. In fact, you can see the images now because I removed a .htaccess file from my images directly that was used to prevent image hotlinking. Ok now I understand why I can see the images. update you theme to show the tags. get yourself a tag cloud too. it’ll impress the pilgrims. concerning bugs with the new version, most of the problem you might experience would be theme related. That’s the usual culprit. at least for me it usually has been. i won’t be moving on to wordpress 2.5 yet, major versions are usually the ones that have the highest amount of bugs to be found :p.
A problem with the notifications. I mentioned last time but kinda forgot about it afterwards. but since you’re asking for bugs. the email notifications still aren’t working. It could just be the plugin at fault. check if you can send mail via php. in your website’s directory and accessing it through a browser. or it could just be me. send me a test message via php to the email I used to post this comment. If I get it maybe it’s something else with the plugin. Now can see the carefully chosen pictures of yours in your blog post in Google Reader. I have also installed WordPress 2.5 on my server. Got to explore it well. and lol how I lol at your enthusiasm. the dashboard redesign is pretty nice. things are simpler, less tabs all over the place. 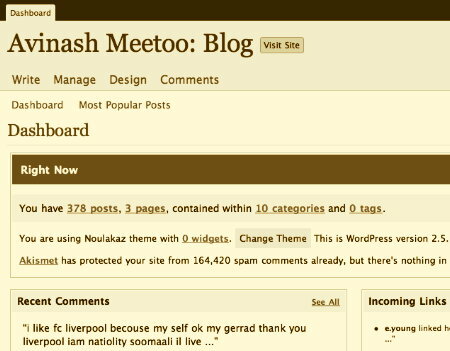 but when we come to the new post page, which, it should be stated, is the core purpose of a blog, I lol, I lulz, I am even tempted to do some roflmeaoing. the only good thing is that we can start making out some pattern in recent wordpress upgrades. The next major(or even minor) version will always remove something of the previous version that quite a lot of people found to be immensely valuable and add something “new and exciting” that will very likely piss off many long time users.